Here begins the next adventure in the saga of Ayreon, the latest project and the newest chapter from Dutch instrumentalist and musical mastermind Arjen A Lucassen. I had been excited to hear this cd for months since it was announced. Since Lucassen's last project, the humorous Lost In The New Real(Highly recommended by the way!!) featured just him, I was interested to hear what the old Ayreon formula would sound like this time. The story, as most of his Ayreon projects are, is broken up into two discs(42 tracks) spanning nearly ninety minutes of music. As you can probably guess, a lot of the songs are very short, with many interludes included. Stepping in as the “lead” vocalist on this disc, is very talented Tommy Karevik(Kamelot and Seventh Wonder), and what a job he does. The always talented and beautiful Cristina Scabbia from Lacuna Coil is on here as well. Listen for Marco Heitala of Nightwish/Tarot as well. Luccassen is also joined by a whose who of Progressive rock including, Rick Wakeman, Keith Emerson, Jordan Rudess and ex-Genesis guitarist Steve Hackett. Normally I would describe details of every song on this disc, though with this disc that would take writing a complete novel. I will say this, use headphones, or a quiet place to listen to this, as this is a musical journey to be taken on, from start to finish. There are four parts known as “Phases” to this album, that span the two discs. The story told is of an autistic savant whose own father tries to use his son for his own gain. The Prodigy(Karevik) is a math genuis, his father(Michael Mills, who puts in an amazing performance, whom I never heard of before this)is an unstable scientist who is emotionally unavailable. Just listening to the track, The Theory of Everything Part 1, you will be swept up in the awe-inspiring journey. that has just begun. Karevik's always consistent vocals shine throughout the disc, check out the song The Prodigy's World and the short but beautiful Inertia. The song The Teacher, features JB from Grand Magus(another great band that I discovered as a reader of MetalReviews) as the title character and the The Rival(Marco Heitala, and wow does he sound sinister and awesome all at the same time). Love and Envy features Sara Squadrani from Ancient Bards(another amazing Power Metal band from Italy reviewed on MR), and I almost mistook her voice for Scabbia's on this song. The Theory of Everything closes out Phase 1, and Phase 2: Symmetry begins with the The Consultation. Without ruining the story, this is where our story takes a plot twist. The Consultation features a beautifully sung melody by Scabbia, and the song has a very Pink Floyd feel to it. The song also features John Wetton(Asia, ex-King Crimson) who plays The Psychiatrist who listens to The Prodigy's parents, as they are searching for a way to help their son. Other standout songs on Phase 2, are Diagnosis and The Rival, featuring Heitala's signature vocals. Quantum Chaos features one of the heaviest riffs I have heard on a Ayreon cd. Phase 3 and 4 continue the story, without much repetition from earlier parts of the disc. The music is of the highest quality throughout, without any music in there just for filler. The story has its twists, and like I said before, I do not want to ruin it for anyone. Quid Pro Quo, is an amazing duet on Phase 3, between Karevik and Hietala, and brings our enemies into immediate conflict. Fortune closes out Phase 3 with Hietala showing off his amazing range. Phase 4 closes out the story with the same energy Phase 1 entered with. Phase 4 is less darker, and contains more emotional vocals from all the singers involved. The Uncertainty Principle features stunning performances from Karevik and Squadrani. 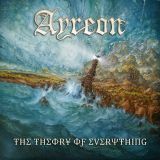 I had learned about Ayreon prior to The Human Equation cd and now own everything that Lucassen has put out. Theory of Everything is probably his greatest achievement in my opinion, and one of the greatest conceptual rock albums made(right up there with Queensryche's Operation Mindcrime and Pink Floyd's The Wall...I'll throw in Seventh Wonder's Mercy Falls as well, as it is one of my personal favorites). I have no idea how Lucassen will top this amazing piece of art, but I am sure he will! For fans of any Lucassen/Ayreon album. If you have wondered who the hell this guy is, and you like progressive rock and metal music, take the time to discover all the amazing music Lucassen's projects have to offer.